INDIANAPOLIS — If you are looking for a career field that is in demand right now, look no further than nursing. St. Vincent is looking to hire hundreds of nurses right now in a variety of positions here in central Indiana. The goal right now is to hire about 500 nurses to meet the needs here in our community. The breakdown of job opportunities is approximately 350 nurses at central Indiana hospital locations, and 150 nurses in their neighborhood and physician locations. Kelsey Stein, a nurse, has been working on the emergency room floor for about two years now at St. Vincent Hospital Indianapolis. "A normal day as an ER nurse...there isn't one," Stein said. "Some days you will come in and your patient will be calm and friendly and stable and other days you come in and start CPR before you've had a sip of coffee." The unknown and the adrenaline rush is part of why Stein feels at home in her position in the ER. "That's what i love about it," Stein said. "It's always different. It's always changing. And that's what makes it exciting and challenging for me." To many, the environment in the ER may be too high stress. But there are a number of different nursing positions open with St. Vincent. "The one constant I can count on every single day is that i have an incredible team," Stein said. Part of the reason for the demand for nurses right now is the aging baby boomer population. That population is growing increasingly older and is more and more in need of health care. The nursing population is also aging nationally as well. Mary Myers, chief nursing officer for St. Vincent Indianapolis, said the average age for a nurse at St. Vincent is 38, which is actually lower than the national average. St. Vincent also expects about 20% of their current nursing staff to near retirement in the next decade or so. Still, they are looking for more ways to get in front of high school students to share with them the flexibility, stability, and benefits a career in nursing can offer. "As a nurse you can make such a positive difference for all the lives that you touch," said Stein, who has worked in nursing for more than 30 years. "You have to be able to multitask and be able to juggle multiple priorities, and really delegate to the team around you to help care for the needs of those you serve." Myers says nurses make good wages and have flexible schedules that can adapt and change over time. Nurses with St. Vincent also have an opportunity to earn overtime pay and also higher pay on weekends and holidays. They also allow their nurses to work various shifts like 3 days of 12 hours or other part time options, which can be beneficial to starting a family. Myers says people can also choose this profession later in life, and there are local programs to help them get their degree. St. Vincent partners with Marion University to provide more options for getting a bachelor's degree in nursing. "So you can have a bachelor's degree in biology. They have an Accelerated BSN program. 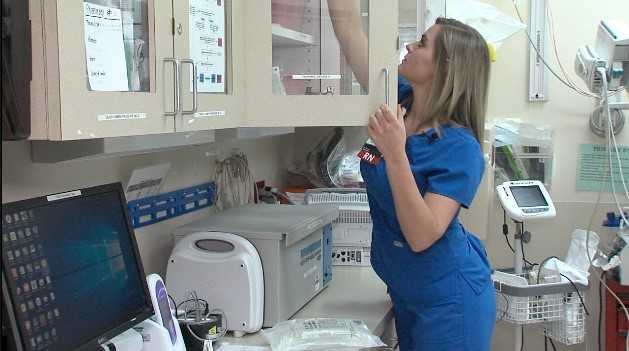 You can get your bachelor's in nursing with the accelerated program in 16 months," Myers said. "We also have Ivy Tech in the city and they have a large ASN program. You can get your ASN degree — your associates in nursing degree — in two years or less." Another important part of nursing is deciding where you fit in. Nurses can change positions and roles throughout their careers but Stein suggests doing a little research ahead of time so you know where you would fit in the best. "The biggest piece of advice I could give to someone is to shadow a nurse," Stein said. "We have a lot of opportunities here within St. Vincent to shadow nurses in different departments." St. Vincent is a Catholic hospital providing holistic care to patients and so the hospital is always looking for employees who can treat the whole patient — body, mind and spirit. Myers tells us the hospital also uses simulation systems to help with the onboarding process so their nurses can prepare for various scenarios they may face on the floor. St. Vincent also provides mentors in the onboarding process so nurses can continue to learn and grow in the profession. St. Vincent is having a nursing recruitment event and open house on May 8 from 5:30 to 8 p.m. at the William K. Nasser, MD, Healthcare Education and Simulation Center, 1801 W. 86th St. The event is free and open to experienced RNs. The event is set to take place during National Nurse's Week (May 7 to 13).